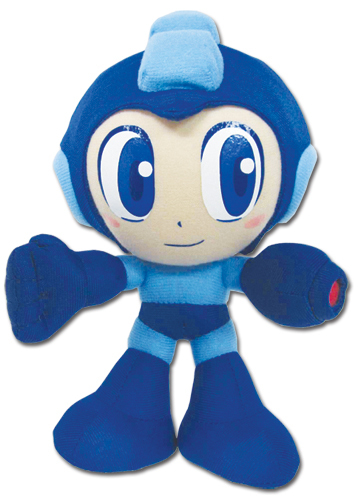 As one might recall, GE Animation pulled the official Mega Man plush from its previously-planned April 30th release for reasons unknown. Being one of the more anticipated products from GE's Mega Man line, some folks took this as a sign it wasn't coming out at all. Fortunately, that is not the case: AAA Distribution has revealed that the plush is now poised to be released on November 30 for $13.99. Retailers interesting in stocking the plush can preorder it directly from GE Animation. or AAA Distribution. So yeah, expect to see this little guy on store shelves in December. If that wasn't enough, I bring even more good news: I've learned GE Animation are exploring the possibility of more Mega Man plush characters! They are still working on approval and licensing, but it seems the success of the Blue Bomber plush could help pave the way for more soft and cuddly characters. Anyone in particular you'd like to see? Try to limit your wishlist to Classic series characters only, please. Oh good. :) I do have to wonder why it was hit with such a large delay, though--trying to bring it closer to the anniversary date? As for other characters, I'd suggest Roll, Iceman, Tango, and Beat. Gutstank, Yellow Devil, and the Badass Dragon I Forgot The Name. Those would be the ultimate badassery of plushies. Mets. Hundreds and Hundresds of MEEEETTTTSSSSSS!!!!!! I'd love a Met, too. I've been making knitted ones, I'd like a big pillow one to go with my keychain one. Just some thoughts. Maybe a plush Beat? The less parts the better maybe? Remember the Ice Man doll from the Clown Man stage in Mega Man 8? Actually a plush set of all 8 Powered Up Robot Masters would be kinda cool. Well, my top pick would be an Iris plushie, but if we're limited to Classic, I'd say Splash Woman. Let me know when they get the date for the Aile plushie. Or a Luna plushie, I'd get one of those too. Otherwise, they best be making Rush. Lessee... I'd want a Met, Skullman, Enker, Galaxyman, Pharaohman, Gutsman, Cutman, Beat, Tango, Rush, and Sheepman. That's my wishlist in order of how badly I want them. I hope they make plush characters of protoman, roll, bass , duo, rush, beat and a met. that would at least take care of the main cast of characters and besides there has to be a met since they are the most iconic enemy in the megaman games. Also a bass plush would be nice because there hasn't been any good bass merchandise made since 99-2000. I know there was the wonderfest bass figure but the price makes it pretty much unobtainable. It's like every company forgets that he was one of the major main characters in the original mm series along with protoman and mm himself. Jeez, it looks kinda weird, but cute none the less! Kinda reminds me of the clay model of Pippi from Earthbound Zero if anybody knows what im talkin bout.. I want a giant (giant compared to the sizing for Mega Man) Yellow Devil plush! I will cuddle with him at night and crush him while I sleep! Haha! Unrealistically, I want a plush of all the classic characters. :D I can't choose because I love them all!